The room numbers and descriptions are those referred to on the pompeiiinpictures pages at IX.14.4. 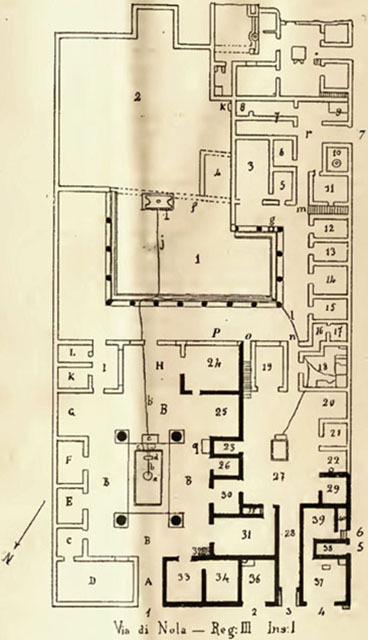 The plan and room numbers are those contained in the Notizie degli Scavi di Antichita, 1911, page 332, figure 1. The descriptions are those published in several years of NdS. Some descriptions have either not been published or we have not yet located them. Note that in the Notizie degli Scavi di Antichita the house is referred to as being in Reg. III, Ins.1 and the Casa del Conte di Torino. 3: Oecus in south-west corner overlooking the west side of the peristyle. 11: Room north of stairs (m). Note that in the Notizie degli Scavi di Antichita the house is referred to as being in Reg. III, Ins.1.